In fast food’s accelerating value wars, Burger King remains an industry frontrunner. The chain reported impressive comparable same-store sales growth of 4.6 percent in the fourth quarter. Restaurant Brands International CEO Daniel Schwartz credited much of the success to Burger King’s performance in the competitive arena. “We believe that maintaining this balanced menu offering to provide our guests with products they love at great prices will continue to drive further sales growth over the long run,” Schwartz said in a conference call Monday morning. Schwartz added that Burger King’s Bacon King and Crispy Chicken Sandwich performed “particularly well” in 2017 and the chain rolled out several successful value promotions during the quarter that lifted the brand’s results. Burger King’s stellar performance carried RBI to a Wall Street-busting quarter. The Canada-based company, which also operates Tim Hortons and Popeyes Louisiana Kitchen, saw its total revenue climb 11 percent to $1.23 billion, year-over-year. Excluding one-time items, RBI earned 66 cents per share, beating analysts’ average estimate of 57 cents, according to Thomson Reuters. RBI’s fourth-quarter net income came in at $215.2 million. Burger King’s financials popped across the board. Systemwide sales growth was 12.3 percent in the three months ended December 31. A year ago, it was 8.5 percent. Comps, again, were 4.6 percent. They were 2.8 percent in the prior-year period. And Burger King is growing as well, reporting 6.5 percent net restaurant growth compared to 4.9 percent in the year-ago period. There were 7,226 Burger Kings in the U.S. as of December 31 after the company added a net of 70 new restaurants. And speaking of the U.S., Burger King’s comparable sales stateside were up 5.1 percent in the fourth quarter compared to just 1.8 percent in 2016. Josh Kobza, RBI’s chief financial officer for the past five years, who recently transitioned into a new role as chief technology and development officer, broke down Burger King’s growth potential in the call. Burger King ended 2017 with more than 875 restaurants in China, up from about 650 at the end of 2016. The company opened its 500th restaurant in Russia this past year and closed 2017 with more than 520 units—growth of about 100 restaurants. France grew its footprint over 200 locations. Brazil ended 2017 with nearly 700 locations compared to about 600 the prior year. “The pace at which partners like these are opening around the world highlights the strength and scale potential of our master franchise development model,” he said. “To further accelerate that growth all around the world we set up a number of new partnerships for Burger King in 2017.” This includes Africa, Japan, Taiwan, the United Kingdom, and the Netherlands. For fiscal 2017, Burger King saw its comps rise 3.1 percent. RBI’s other brands didn’t report quite as bullish results. Tim Hortons posted comparable same-store sales growth of 0.1 percent and Popeyes slid to a 1.3 percent decline, although improvements are showing for the company’s most recent acquisition. Tim Hortons’ comps fell 0.1 percent in fiscal 2017. Schwartz said RBI made progress, especially in regards to technology, with the concept. Tim Hortons launched its mobile app in 2017 as well as an espresso-based beverage platform in Canada and the U.S. The chain also opened its first restaurants in Asia, Europe, and Latin America. Schwartz said some of the chain’s success with breakfast, both with sandwiches (steak and simply sausage offers were hits) and new coffee products, was offset by soft lunch results. As for Popeyes, like in recent quarters, Schwartz said the integration was a work in progress. Popeyes reported 1.5 percent comparable same-store sales declines for the year. Systemwide sales were up 5.1 percent driven by net restaurant growth of 6.1 percent, offset by the comp drops. The chain struggled in the U.S. as well, posting negative 2.2 percent comps. There were 2,212 Popeyes in the U.S. as of December 21. Yum! Brands, Inc. (NYSE: YUM) today reported results for the fourth quarter ended December 31, 2017. Fourth-quarter GAAP EPS was $1.26, an increase of 53%. Full-year GAAP EPS was $3.77, an increase of 48%. Fourth-quarter EPS excluding Special Items was $0.96, an increase of 20%. Full-year EPS excluding Special Items was $2.96, an increase of 20%. All comparisons are versus the same period a year ago. Effective January 2017, we removed the reporting lags from our international subsidiary fiscal calendars. To accommodate these changes, Yum! Brands now reports on a monthly calendar basis though certain subsidiaries, including our U.S. subsidiaries, continue to be included in our consolidated results on a periodic basis with 3, 3, 3 & 4 four-week periods in each quarter, respectively. Prior year figures in this earnings release have been restated to present comparable results. An 8-K was filed on April 13, 2017 with restated quarterly and full-year 2016 results. 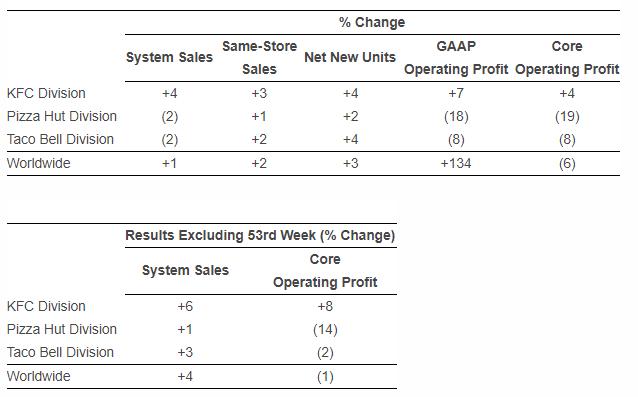 System sales growth figures exclude foreign currency translation (“F/X”) and core operating profit growth figures exclude F/X and Special Items. Special Items are not allocated to any segment and therefore only impact worldwide GAAP results. See Reconciliation of Non-GAAP Measurements to GAAP Results within this release for further details. Worldwide system sales grew 4%, with KFC at 6%, Taco Bell at 3% and Pizza Hut at 1%, excluding the 53rd week. We opened 730 net new units for 3% net unit growth. We refranchised 896 restaurants, including 685 KFC, 144 Pizza Hut and 67 Taco Bell units, for pre-tax proceeds of $1.1 billion. We recorded net refranchising gains of $752 million in Special Items. As of quarter end, our global franchise ownership mix increased to 97%. We repurchased 7.5 million shares totaling $588 million at an average price of $79. Foreign currency translation favorably impacted divisional operating profit by $9 million. Worldwide system sales grew 5%, with Taco Bell at 7%, KFC at 6% and Pizza Hut at 2%, excluding the 53rd week. We opened 1,407 net new units for 3% net unit growth. We refranchised 1,470 restaurants, including 828 KFC, 389 Pizza Hut and 253 Taco Bell units, for pre-tax proceeds of $1.8 billion, recording net refranchising gains of $1.1 billion in Special Items. We repurchased 26.6 million shares totaling $1.9 billion at an average price of $72. FAT (Fresh. Authentic. Tasty.) Brands Inc. (NASDAQ: FAT) (“FAT Brands” or the “Company”), a leading global restaurant franchising company, today announced that its Board of Directors has approved its first quarterly cash dividend. The Company’s Board of Directors declared an initial quarterly dividend of $0.12 per share of common stock, payable on April 16, 2018 to stockholders of record as of the close of business on March 30, 2018. “We are pleased to announce the initiation of a quarterly cash dividend, which we believe reflects the strength and stability of our business model. Our predictable cash flow generation and strong balance sheet provide the financial flexibility to continue to grow our portfolio of brands while simultaneously returning a meaningful amount of capital to our stockholders,” said Andy Wiederhorn, President and CEO of FAT Brands. The Company also intends to launch a Dividend Reinvestment Plan (“DRIP”), under which interested stockholders may reinvest all or a portion of their cash dividends in additional common shares of FAT Brands without paying any brokerage commission or service charge. The DRIP will be administered by the Company’s transfer agent, which will distribute plan enrolment materials and information to stockholders in the coming weeks. The Company’s controlling stockholder, Fog Cutter Capital Group, intends to reinvest its cash dividend into the Company as provided under the DRIP thereby allowing the Company to retain capital to continue its growth plans. The declaration and payment of future dividends, as well as the amount thereof, are subject to the discretion of the Company’s Board of Directors. The amount and size of any future dividends will depend upon the Company’s future results of operations, financial condition, capital levels, cash requirements and other factors. There can be no assurance that the Company will declare and pay dividends in future periods. 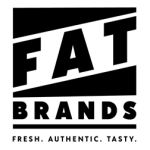 FAT Brands (NASDAQ: FAT) is a leading global franchising company that strategically acquires, markets and develops fast casual and casual dining restaurant concepts around the world. The Company currently owns five restaurant brands, Fatburger, Buffalo’s Cafe, Buffalo’s Express and Ponderosa & Bonanza Steakhouses, that have approximately 300 locations open and 300 under development in 32 countries. For more information, please visit www.fatbrands.com. Chipotle Mexican Grill, Inc. (NYSE: CMG) today reported financial results for its fourth quarter and year ended December 31, 2017. The conference call can be accessed live over the phone by dialing 1-877-451-6152 or for international callers by dialing 1-201-389-0879. The call will be webcast live from the company’s website on the investor relations page at ir.chipotle.com. An archived webcast will be available approximately one hour after the end of the call. Added 440 net new restaurants worldwide, including 313 net new Dunkin’ Donuts in the U.S.
Added 141 net new restaurants worldwide, including 126 net new Dunkin’ Donuts in the U.S.
Dunkin’ Brands Group, Inc. (Nasdaq: DNKN), the parent company of Dunkin’ Donuts (DD) and Baskin-Robbins (BR), today reported results for the 13-week fiscal fourth quarter and 52-week fiscal year ended December 30, 2017. Total consolidated revenue decreased 38.1% to $4.2 million compared to $6.8 million in the second quarter of fiscal 2017. – Pizza Inn domestic comparable store retail sales increased 2.7% from the same period of the prior year, while total domestic retail sales decreased by 3.3%. RAVE Restaurant Group, Inc. (NASDAQ: RAVE) today reported financial results for the second quarter of fiscal 2018 ended December 24, 2017. Total consolidated revenue decreased 38.1% to $4.2 million compared to $6.8 million in the second quarter of fiscal 2017. Pizza Inn domestic comparable store retail sales increased 2.7% from the same period of the prior year, while total domestic retail sales decreased by 3.3%. Pie Five comparable store retail sales decreased 13.7% from the same period of the prior year, while total system-wide retail sales decreased by 18.8%. Company-owned Pie Five average weekly sales increased 10.2% year over year. Net loss improved by $7.3 million to $0.6 million for the second quarter of fiscal 2018 compared to $7.9 million for the same quarter of the prior year, primarily due to closures of underperforming Company Pie Five units, lower closed store expenses, increased gains from sale of assets, lower impairment expenses, lower lease termination expenses, and reductions to general and administrative expenses. On a fully diluted basis, the company reported a loss of $0.04 per share for the second quarter of fiscal 2018 compared to a loss of $0.74 per share for the same period of the prior year. Adjusted EBITDA of ($0.2) million was $0.9 million better than the same quarter of the prior year. Company-owned Pie Five operating cash flow decreased $0.1 million from the same period of the prior year. Net reduction of three Pie Five restaurants during the quarter brought the total Pie Five restaurants open at the end of the quarter to 80. Revenues of $4.2 million and $9.6 million for the second quarter and year to date fiscal 2018 were 38.1% and 32.4% lower, respectively, than the same periods of the prior year. For the three and six month periods ended December 24, 2017, the Company reported a net loss of $0.6 million and $0.9 million, respectively, compared to a loss of $7.9 million and $9.4 million for the same periods of the prior year. On a fully diluted basis, the loss was $0.04 per share and $0.07per share, respectively, for the second quarter and year to date fiscal 2018, compared to a loss of $0.74 per share and $0.89 per share for the same periods of the prior year. The decreased loss for the three month period ended December 24, 2017 was primarily the result of $5.8 million improvement in loss from continuing operations before taxes from Company-owned restaurants, $0.8 million improvement in gain on sale of assets, and $0.5 million decrease in corporate general and administrative expenses. The decreased loss for the six month period ended December 24, 2017 was primarily the result of $6.4 million improvement in loss from continuing operations before taxes from Company-owned restaurants, $0.9 million improvement in gain on sale of assets, and $0.4 million decrease in corporate general and administrative expenses. The Company continued to provide a full valuation allowance against its deferred tax assets. Adjusted EBITDA improved $0.9 million and $1.4 million for the three and six month periods ended December 24, 2017to ($0.2) million and $0.5 million, respectively. The improvement in Adjusted EBITDA was driven by improvements to net loss, decreased depreciation and amortization, increased average weekly sales at Company-owned Pie Five locations, and positive comparable sales at Pizza Inn locations. During the fiscal quarter ended December 24, 2017, the Company discontinued its Norco distribution division and revised its arrangements with third party suppliers and distributors of food, equipment and supplies. As a result, sale of food, equipment and supplies is no longer recognized as revenue and the cost of such items is no longer included in cost of sales. The Company now recognizes incentive revenues received from third party suppliers and distributors as revenue. “Our new, simplified approach to supply chain management provides more transparency and efficiency for our franchisees. It has also provided us opportunities to make reductions in general and administrative costs,” said Crane. 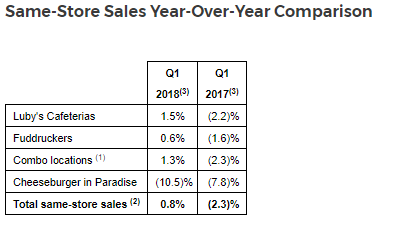 Pie Five system-wide retail sales decreased 18.8% for the second quarter of fiscal 2018 when compared to the same period in the prior year, primarily driven by a 15.5% decrease in average units open. Comparable store retail sales decreased by 13.7% for the most recent fiscal quarter compared to the same period in the prior year. Year to date, Pie Five system-wide retail sales decreased 18.0% compared to the same period in the prior year, primarily driven by a 10.8% decrease in average units open. Comparable store retail sales decreased by 15.5% during the first six months of fiscal 2018 compared to the same period of the prior year. In keeping with health-based consumer trends, Pie Five recently introduced a cauliflower pizza crust to its dough line-up. The new cauliflower crust, along with continued testing of other product innovations, are all part of enhancing the Pie Five guest experience. “We continue to see an opportunity to take advantage of growth in areas such as delivery, cauliflower pizza crusts, and shareable pizzas, with the goal of increasing frequency among our loyal guest base,” said Crane. 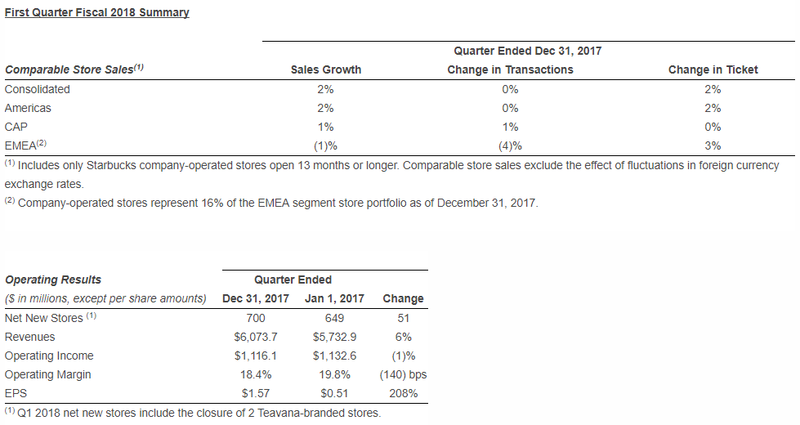 Pizza Inn total domestic retail sales decreased 3.3% and 2.1%, respectively, for the three and six month periods ended December 24, 2017, compared to the same periods of the prior year. Pizza Inn domestic comparable store retail sales increased 2.7% and 2.2%, respectively, for the three and six month periods ended December 24, 2017, compared to the same periods of the prior year. Geared towards convenience stores, but also an airport or entertainment venue option, P.I.E will allow customers to order and pay at a kiosk for grab-and-go, or pick up their food at a designated spot. Pizza Inn has a strong presence in the southeastern part of the country where the convenience store segment has the nation’s highest grouping of independent operators. In the second quarter of fiscal 2018, two new franchised Pie Five restaurants were opened, while five franchised restaurants were closed, bringing the quarter-end total unit count to 80 restaurants. The Company also refranchised 11 Company-owned locations in the DFW market during the quarter. During the second fiscal quarter, the number of Pizza Inn domestic units declined to 156, while international units increased to 62. Founded in 1958, Dallas-based RAVE Restaurant Group [NASDAQ: RAVE] owns, operates and franchises approximately 300 Pie Five Pizza Co. and Pizza Inn restaurants domestically and internationally. Pie Five Pizza Co. is a leader in the rapidly growing fast-casual pizza space offering made-to-order pizzas ready in under five minutes. Pizza Inn is an international chain featuring freshly made pizzas, along with salads, pastas, and desserts. The Company’s common stock is listed on the Nasdaq Capital Market under the symbol “RAVE”. Inspire Brands, Inc., a new global, multi-brand restaurant company, launched today following the completion of a $2.9 billion acquisition of Buffalo Wild Wings, Inc. by Arby’s Restaurant Group, Inc.
Inspire was co-founded by Paul Brown of Arby’s and Neal Aronson of Roark. Brown will serve as Chief Executive Officer of the company. Inspire will oversee the continued growth and success of Arby’s, Buffalo Wild Wings and an emerging brand, R Taco, while building a platform for future strategic additions. Inspire is one of the largest owner-operators of restaurants with more than 1,700 company-owned restaurants. System wide, Inspire includes more than 4,600 company-owned and franchised restaurants with more than 150,000 team members across 15 countries. The combined 2017 global system sales of its restaurants exceeds $7.6 billion. The objective of Inspire is to build a family of powerful, distinct restaurant brands that each have high-growth potential, both domestically and Internationally. The Inspire organization is designed to enable each individual brand to benefit from and build off the strengths of the others. Inspire will be led by a team of executives with deep and diverse experience in the restaurant industry, as well as with other multi-brand organizations. The Inspire headquarters will be based in Atlanta, Ga., and it will also operate a support center in Minneapolis, Minn.
Nathan’s Famous, Inc. (NASDAQ: NATH) today reported results for the third quarter of its 2018 fiscal year that ended December 24, 2017. Loss per diluted share was $0.90per share, as compared to earnings of $0.17 per share for the thirteen weeks ended December 25, 2016. Earnings per diluted share was $0.54per share, as compared to $1.61 per share for the thirty-nine weeks ended December 25, 2016. Nathan’s is a Russell 2000 Company that currently distributes its products in 50 states, the District of Columbia, Puerto Rico, the U.S. Virgin Islands, Guam, and thirteen foreign countries through its restaurant system, foodservice sales programs and product licensing activities. Last year, over 600 million Nathan’s Famous hot dogs were sold. Nathan’s was ranked #22 on the Forbes 2014 list of the Best Small Companies in America and was listed as the Best Small Company in New York State in October 2013. For additional information about Nathan’s please visit our website at www.nathansfamous.com. Good Times Restaurants Inc. (Nasdaq: GTIM), operator of Good Times Burgers & Frozen Custard, a regional quick service restaurant chain focused on fresh, high-quality, all-natural products and Bad Daddy’s Burger Bar, a full-service, upscale concept, today announced its preliminary unaudited financial results for the first fiscal quarter ended December 26, 2017. Total revenue estimates assume same store sales of approximately +3.5% for Good Times for the balance of the year, and approximately 4.1% for FY2018 in total. We expect same store sales of 1.3% for the year for Bad Daddy’s, including a three-week closure of the original Bad Daddy’s for building renovations. We expect comparable sales of 2.1%, 0.3%, and 2.0% for Q2, Q3, and Q4 respectively. Conference Call: Management will host a conference call to discuss its first quarter 2018 financial results on Thursday, February 1st at 3:00 p.m. MST/5:00 p.m. EST. Hosting the call will be Boyd Hoback, President and Chief Executive Officer, and Ryan Zink, Chief Financial Officer. The conference call can be accessed live over the phone by dialing (888) 339-0806 and requesting the Good Times Restaurants (GTIM) call. The conference call will also be webcast live from the Company’s corporate website www.goodtimesburgers.com under the Investor section. An archive of the webcast will be available at the same location on the corporate website shortly after the call has concluded. About Good Times Restaurants Inc.: Good Times Restaurants Inc. (GTIM) operates Good Times Burgers & Frozen Custard, a regional chain of quick service restaurants located primarily in Colorado, in its wholly owned subsidiary, Good Times Drive Thru Inc. Good Times provides a menu of high-quality all-natural hamburgers, 100% all-natural chicken tenderloins, fresh frozen custard, natural-cut fries, fresh lemonades and other unique offerings. Good Times currently operates and franchises a total of 37 restaurants. GTIM owns, operates, franchises and licenses 27 Bad Daddy’s Burger Bar restaurants through its wholly-owned subsidiaries. Bad Daddy’s Burger Bar is a full service, upscale, “small box” restaurant concept featuring a chef driven menu of gourmet signature burgers, chopped salads, appetizers and sandwiches with a full bar and a focus on a selection of craft microbrew beers in a high energy atmosphere that appeals to a broad consumer base. J. Alexander’s Holdings, Inc. (NYSE: JAX) (“J. Alexander’s” or the “Company”) today announced results of the Special Meeting of Shareholders, held on January 30, 2018 and adjourned and reconvened on February 1, 2018 at 2:00 pm central at the Loews Vanderbilt Hotel in Nashville, Tennessee, to vote on the proposed acquisition of 99 Restaurants, LLC (“99 Restaurants”). J. Alexander’s received the requisite number of votes to approve Proposal 1 (shareholder approval of the merger agreement), Proposal 3a (shareholder approval of the reclassification charter amendment), Proposal 3b (shareholder approval of the authorized shares amendment) and Proposal 5 (shareholder approval of the adjournment proposal), but did not receive the requisite number of votes to approve Proposal 2 (disinterested shareholder approval). Therefore, J. Alexander’s expects that the merger agreement will be terminated. The vote is subject to certification by the Independent Inspector of Election. Stout continued: “While we are disappointed that shareholders did not approve this transaction, we are confident in our overall strategy, our strong culture and our ability to deliver value to shareholders. Looking forward, we remain focused on growing our business, strengthening our competitive position and enhancing our current restaurant concepts. J. Alexander’s also announced its preliminary unaudited sales results for the fiscal year and quarter ended December 31, 2017. For the J. Alexander’s Restaurant/Grills restaurants, preliminary results are as follows: average weekly same store sales increased by 2.3% to $117,200 for the quarter ended December 31, 2017 and increased by 3.0% to $114,500 for the fiscal year ended December 31, 2017. For the Stoney River Steakhouse and Grill restaurants, preliminary results are as follows: average weekly same store sales increased by 7.3% to $85,100 for the quarter ended December 31, 2017 and increased by 3.8% to $74,700 for the fiscal year ended December 31, 2017. For the quarter ended December 31, 2017, J. Alexander’s unaudited preliminary net sales are $61,338,000, up 7.0% from the $57,323,000 reported for the quarter ended January 1, 2017. For the fiscal year ended December 31, 2017, J. Alexander’s unaudited preliminary net sales are $233,255,000, up 6.2% from the $219,582,000 reported for the fiscal year ended January 1, 2017. J. Alexander’s Holdings, Inc. is a collection of boutique restaurants that focus on providing high quality food, outstanding professional service and an attractive ambiance. The company presently owns and operates the following concepts: J. Alexander’s, Redlands Grill, Stoney River Steakhouse and Grill and Lyndhurst Grill. J. Alexander’s Holdings, Inc. has its headquarters in Nashville, Tennessee. To learn more about J. Alexander’s, please visit www.jalexandersholdings.com. Sentinel Capital Partners, a private equity firm that invests in promising, lower midmarket companies, today announced it has sold Huddle House, Inc., a leading franchisor of family dining restaurants in the Southeast. Financial terms of the transaction were not disclosed. Based in Atlanta, Georgia, Huddle House was founded in 1964 with a focus on serving quality food in warm, friendly environments that bring communities together. Huddle House offers customers “Any Meal. Any Time.” with a broad menu of high quality, cooked-to-order food, 24-hour service, and breakfast, lunch, and dinner served all day. Huddle House has 349 units that generate more than $240 million in annual system-wide sales. The past year has been highly productive for Sentinel. Besides selling Huddle House, Sentinel also completed exits from Checkers/Rally’s, the nation’s largest franchisor and operator of dual drive-thru hamburger QSRs; National Spine & Pain Centers, a leading service provider to interventional pain management physicians; PlayCore, the leading North American supplier of play, park, and recreation products; and WellSpring Consumer Healthcare, a North American marketer of OTC health brands. Also during the past year, Sentinel made four new platform investments: cabi, a leading direct marketer of women’s fashion apparel; Captain D’s, a leading restaurant operator in the QSR seafood sector; MB2 Dental Solutions, a rapidly-growing dental service organization with a unique physician-centric ownership model; and Nekoosa, a leading manufacturer of specialty paper and film products used in the graphics and commercial print markets. In January 2018, Sentinel also announced the closing of its $2.15 billion sixth private equity fund and its $460 million inaugural junior capital fund. Sentinel Capital Partners specializes in partnering with entrepreneurial executives to buy and build lower midmarket companies in the United States and Canada. Sentinel targets eight industry sectors: aerospace/defense, business services, consumer, distribution, food/restaurants, franchising, healthcare, and industrials. Sentinel invests in management buyouts, purchases of family businesses, corporate divestitures, going-private transactions, and special situations of businesses with up to $65 million in EBITDA. For more information about Sentinel, please visit www.sentinelpartners.com. Committed to serving “Any Meal. Any Time.” Huddle House restaurants have become icons in the communities they serve throughout the country. The core values on which the brand was founded – serving freshly prepared, quality home-style food in a warm, friendly environment that brings the community together – are as true today as they were when it was founded 54 years ago. Today, the brand has 349 locations. 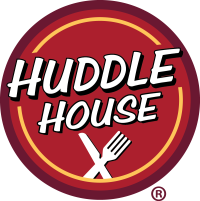 For more information about Huddle House, please visit www.huddlehouse.com. Brinker International, Inc. (NYSE: EAT) today announced results for the fiscal second quarter ended Dec. 27, 2017. McDonald’s Corporation today announced results for the fourth quarter and year ended December 31, 2017. On January 25, 2018, McDonald’s Board of Directors declared a quarterly cash dividend of $1.01 per share of common stock payable on March 15, 2018 to shareholders of record at the close of business on March 1, 2018. Comparable sales for the International Lead segment increased 6.0% for the quarter, led by continued momentum in the U.K. and Canada, as well as positive results across all other markets. The segment’s operating income increased 14% (7% in constant currencies), fueled by sales-driven improvements in franchised margin dollars. Chris Pappas, President and CEO, commented, “We are pleased to have generated positive same-store sales in the first quarter at both of our primary brands, Luby’s Cafeteria and Fuddruckers, leading to a company-wide increase of 0.8% same-store sales. “We are encouraged by the progress of the operational and guest initiatives that we began implementing last year to help improve guest services, store level profit and EBITDA while closely managing expenses. These efforts are contributing to same-store sales growth as well as improving cost controls. In the first quarter, we grew Adjusted EBITDA by over $1.0 million. “Our team continues to focus on enhancing guest experiences across all of our brands, including through in-store operational efficiencies, menu variety and new offerings and speed of service. Luby’s, Inc. (NYSE: LUB) operates 163 restaurants nationally as of December 20, 2017: 88 Luby’s Cafeterias, 68 Fuddruckers, seven Cheeseburger in Paradise restaurants. Luby’s is the franchisor for 111 Fuddruckers franchise locations across the United States (including Puerto Rico), Canada, Mexico, Italy, the Dominican Republic, Panama, and Colombia. Additionally, a licensee operates 34 restaurants with the exclusive right to use the Fuddruckers proprietary marks, trade dress, and system in certain countries in the Middle East. The Company does not receive revenue or royalties from these Middle East restaurants. Luby’s Culinary Contract Services provides food service management to 22 sites consisting of healthcare and corporate dining locations. Starbucks Corporation (NASDAQ:SBUX) last week reported financial results for its 13-week fiscal first quarter ended December 31, 2017. GAAP results in fiscal 2018 and fiscal 2017 include items which are excluded from non-GAAP results. Consolidated operating income declined 1% to $1,116.1 million in Q1 FY18, down from $1,132.6 million in Q1 FY17. Consolidated operating margin declined 140 basis points to 18.4%, primarily due to food-related mix shift in the Americas, as well as restructuring costs related to the company’s ongoing efforts to streamline business operations.